While I was lucky enough to spend three days eating my way around TDR for Halloween, I only managed to squeeze in one day for Christmas. This is such a ridiculous feat that they don’t even sell a passport that allows you to do two parks in one day! The cheapest way to do this would be to buy at least one of the cheaper tickets in the afternoon (either a 3pm pass, if they’re selling them that day, or a 6pm pass). Otherwise, you have to do what I did and buy two full priced tickets – one for each park. I would love to have spent more than a day soaking up TDR’s Christmas (strange as Christmas in early November sounds), but alas, my trip was drawing to a close and it was the best I could do. This also meant I couldn’t try quite as much food as I would have otherwise scoffed down. I promise that my Halloween adventure involves a lot more food than my Christmas one. Come to think of it, there seemed to be more Halloween food on offer, anyway. I wonder if perhaps more Christmas treats become available as the season progresses. I picked up the Christmas guide at Disneyland and it only had a few seasonal treats, but then again, this guide is dated 1st-30th November. Maybe the December version will have more variety (but please don’t quote me on this – I could be completely wrong!). You can find similar information on the TDR website, but I really like these guides as it’s all on the one page. Plus, you can carry it around with you on the day. 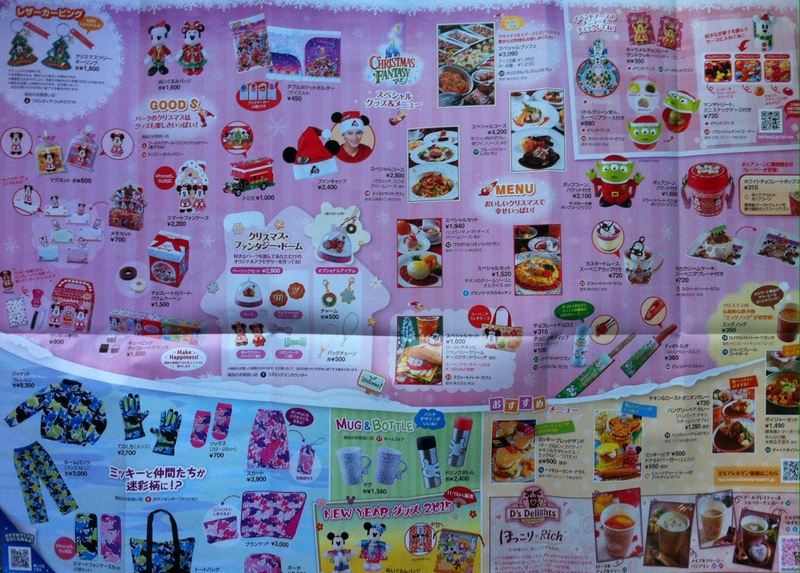 Yes, it’s all in Japanese, but for the most part all you need is the pictures. 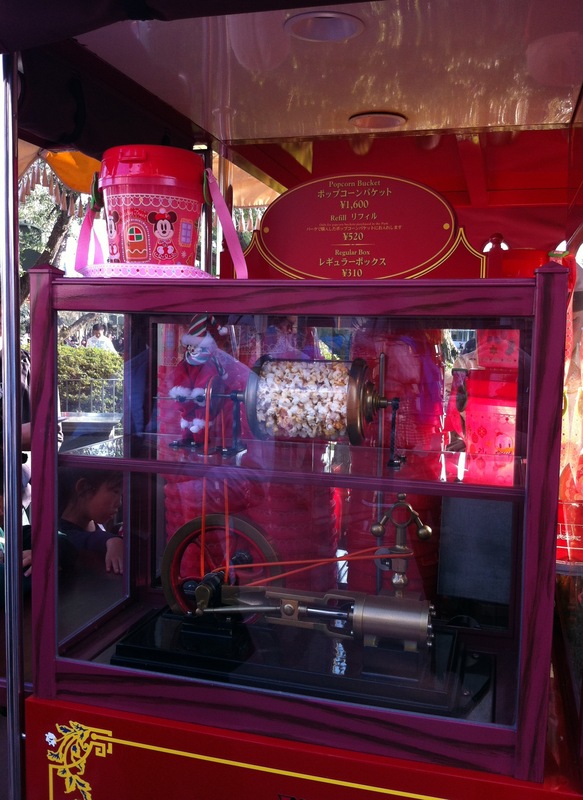 As expected, Christmas food at TDL consists of Christmas themed buffets, restaurant meals, pudding in souvenir cups, lollies in souvenir carriers (snowman Mickey with a Santa hat), Christmas Mickey/Minnie and Little Green Men popcorn carriers, as well as souvenir plates and lunch bags. 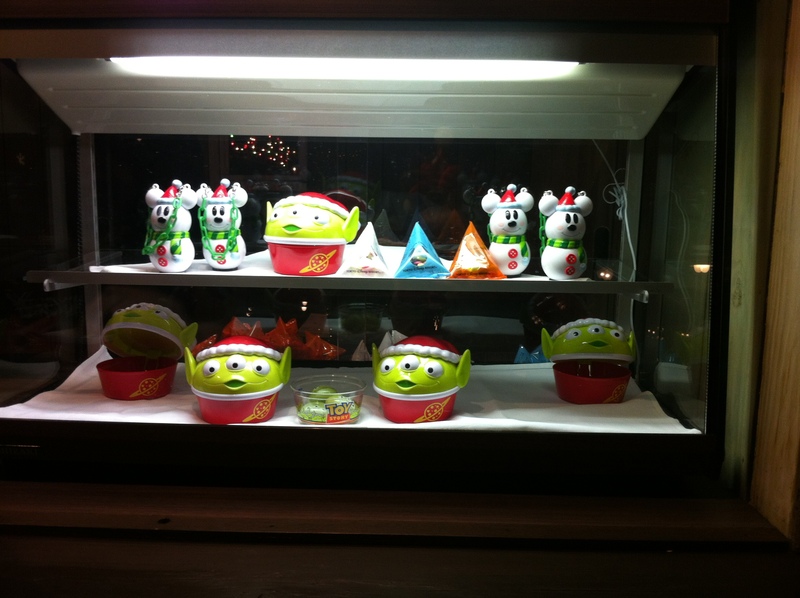 Little Green Men mochi come with a souvenir case (optional). 1. 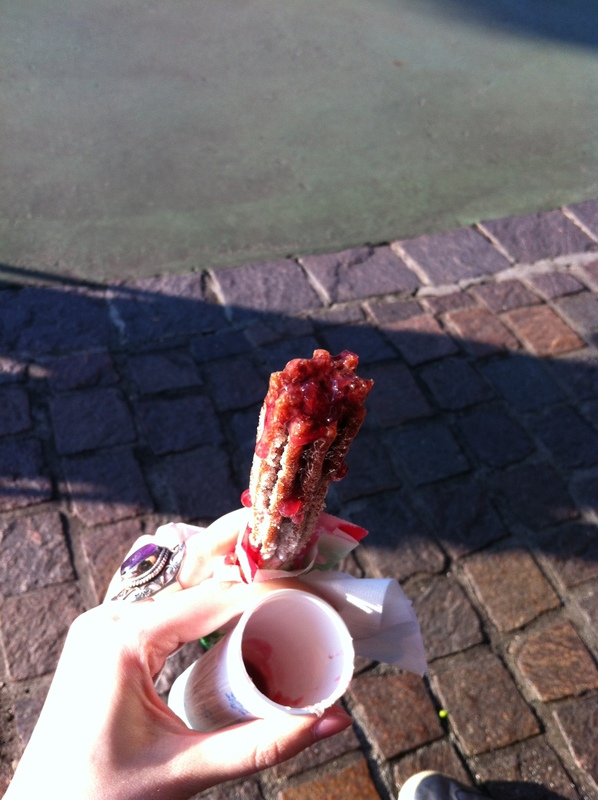 First up was chocolate churros with cranberry dipping sauce from Parkside Wagon. I really liked these. The cranberry sauce went well with the chocolate, and was just tangy enough. If the sign didn’t say that it was cranberry I probably wouldn’t have realised (it tasted a lot like raspberry to me), but either way, it was pretty good. 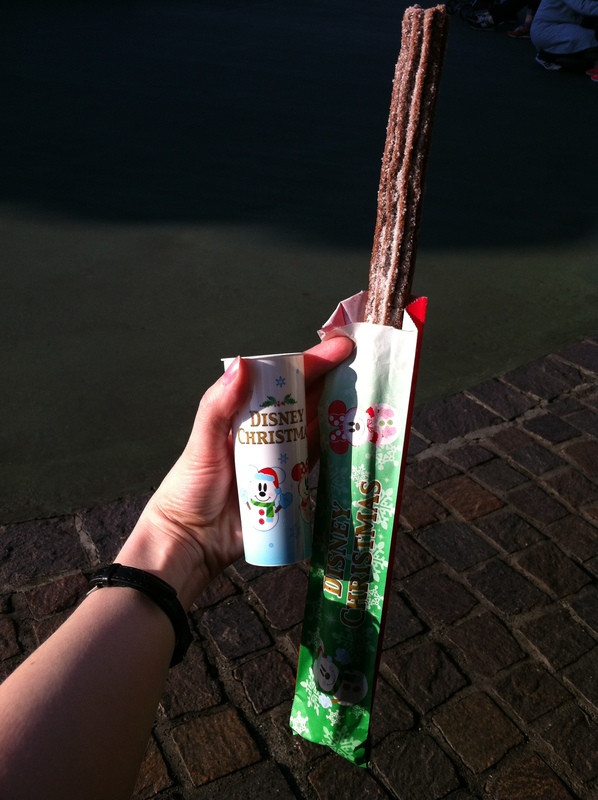 I wonder if the churros are meant to be shaped like snowflakes, since these ones are not in the usual Mickey shape. 2. 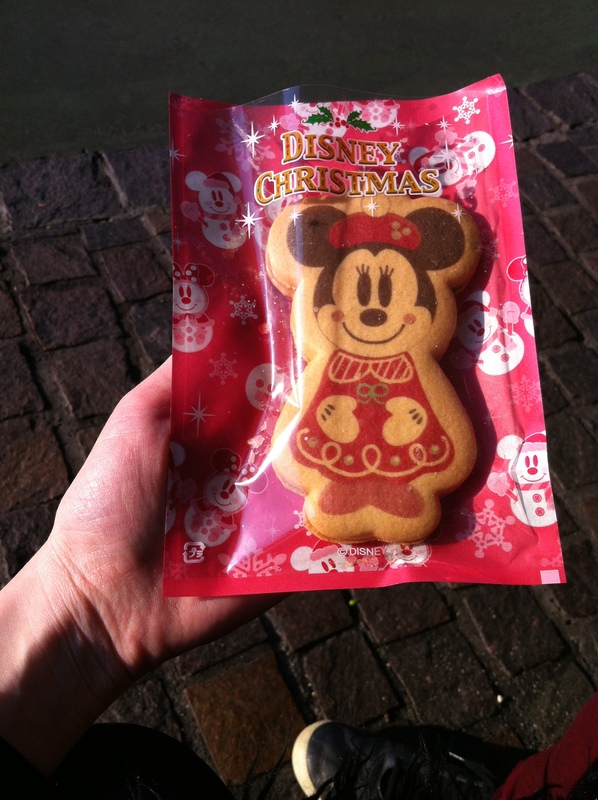 I also tried a Minnie Mouse Christmas sandwich cookie (cookie sandwich?). The filling was caramel-chocolate. Not bad! My partner was not overly impressed, but then again, he has never been a big fan of these cookies. He can’t seem to put his finger on why he doesn’t like them, other than that he thinks he was expecting something different. 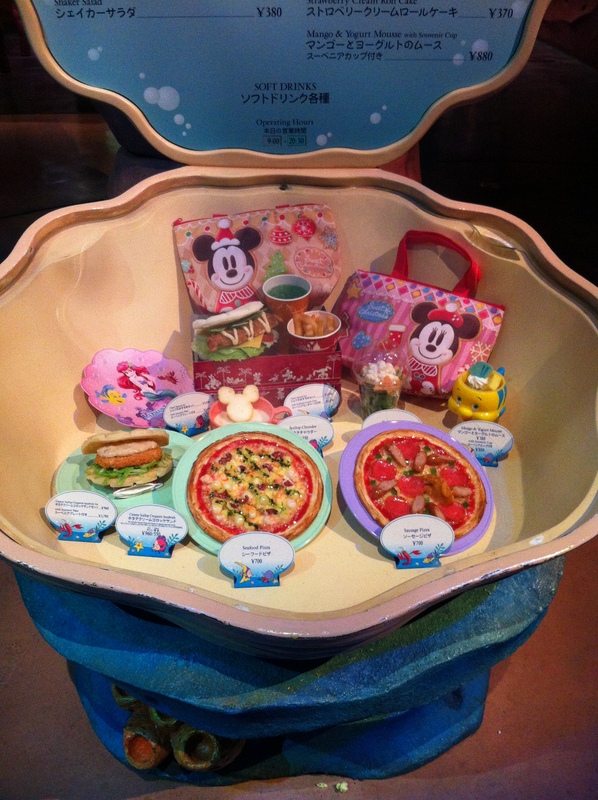 Well I like them (and all of these Tokyo Disneyland cookie sandwiches taste much the same). Not a great shot, I know. I must have been in quite a hurry to eat my churro and cookie sandwich. 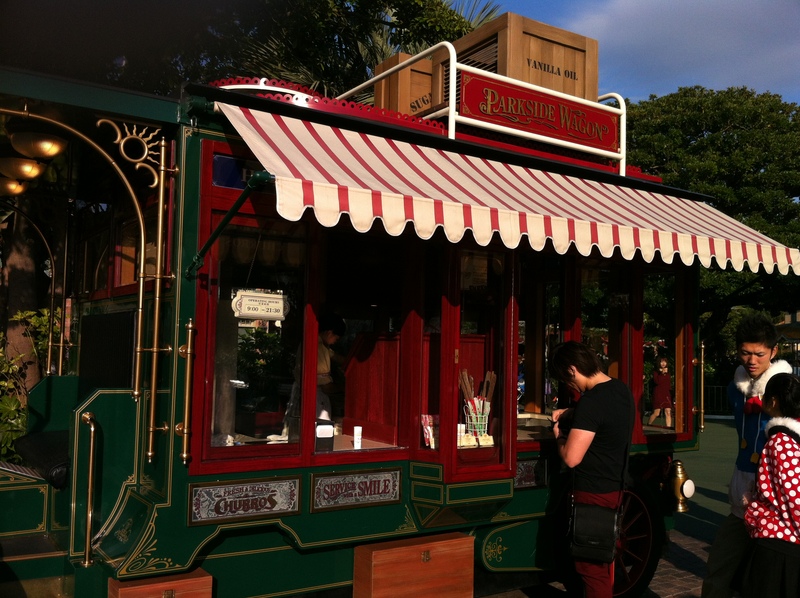 Parkside Wagon is one of those food stands made to look like an old-fashioned truck. 2. Next up was the Christmas tipo torta. This was strawberry and milk flavoured, which I preferred to the Halloween ones (more on those later!). 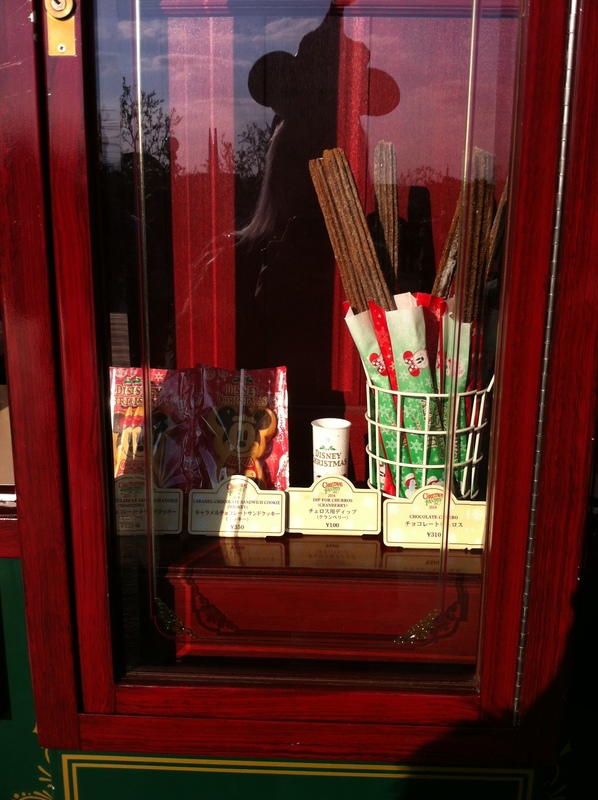 You can find these just near the It’s A Small World ride. If you’re standing, looking at the building where that ride is, the stand with the tipo tortas should be just behind you (there is also a stand with drinks, and another one with headgear). 3. 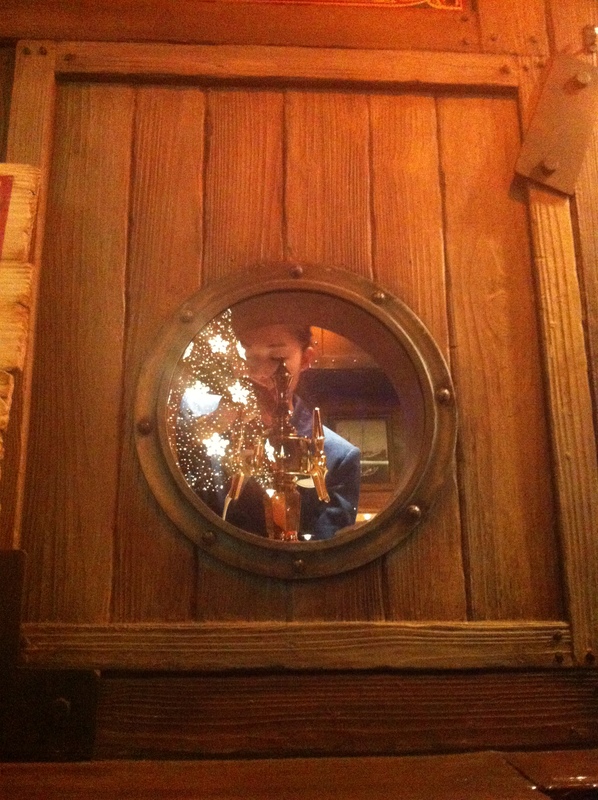 Then I headed over to Disneysea late afternoon (Disneysea is beautiful at night). 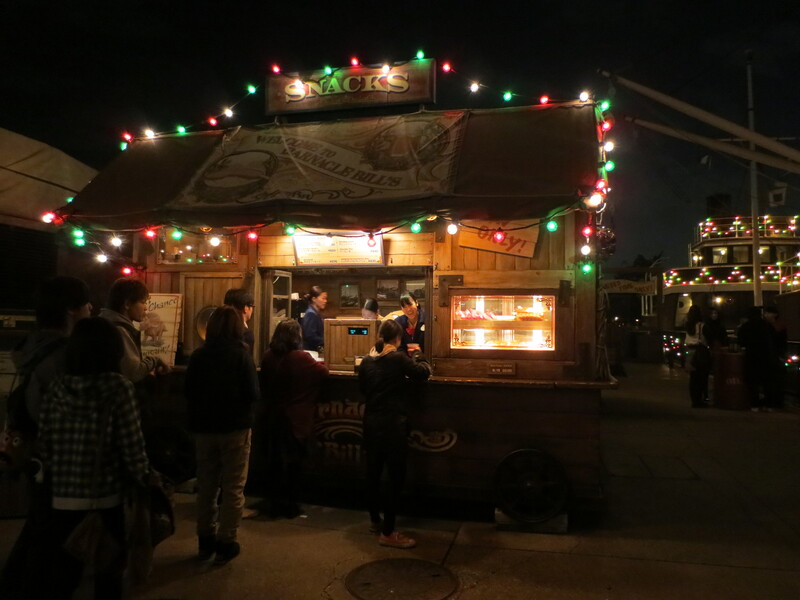 TDS is great for food, although it seemed a little light on Christmas themed food. The first thing I tried was the latest drink at Barnacle Bill’s. 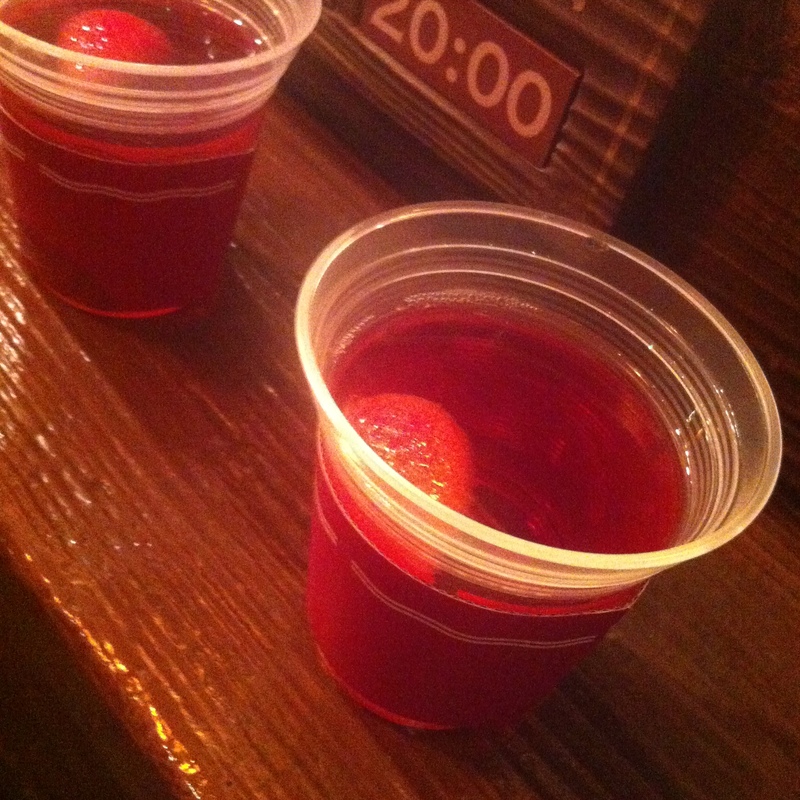 Having done a couple of Halloweens at TDS and being used to the flavoured beers (also known as “beer cocktails”), I was surprised to find warm strawberry rosé instead! This was a little like mulled wine, only it seemed to be made of rosé/pink champagne instead, with a strawberry and something else (another fruit, I think) floating in it, and some spices such as cinnamon. It was quite hot, so I couldn’t drink it straight away. I was a little disappointed with this drink after the beer that they had a week earlier, but I can imagine that in very cold weather, this would be quite nice. 4. 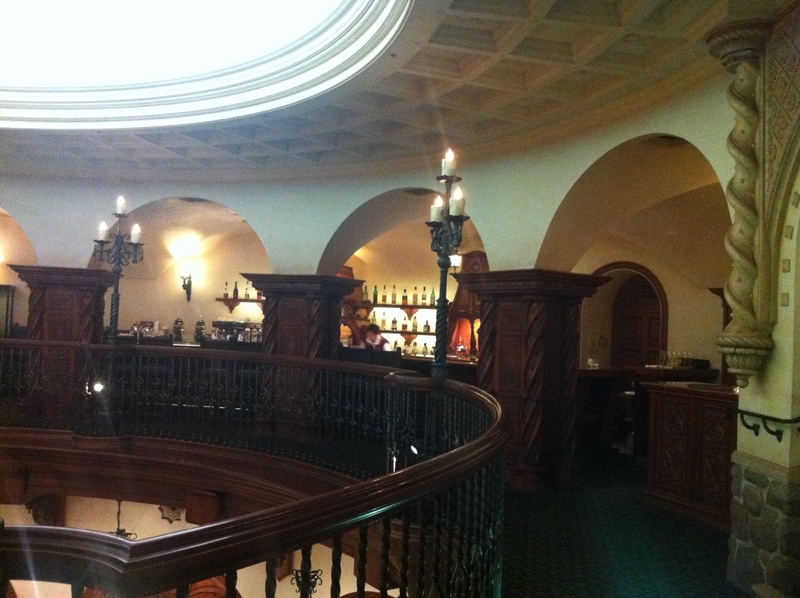 I stopped in at Magellan’s Lounge (the restaurant is downstairs – click here to read about it) for supper. 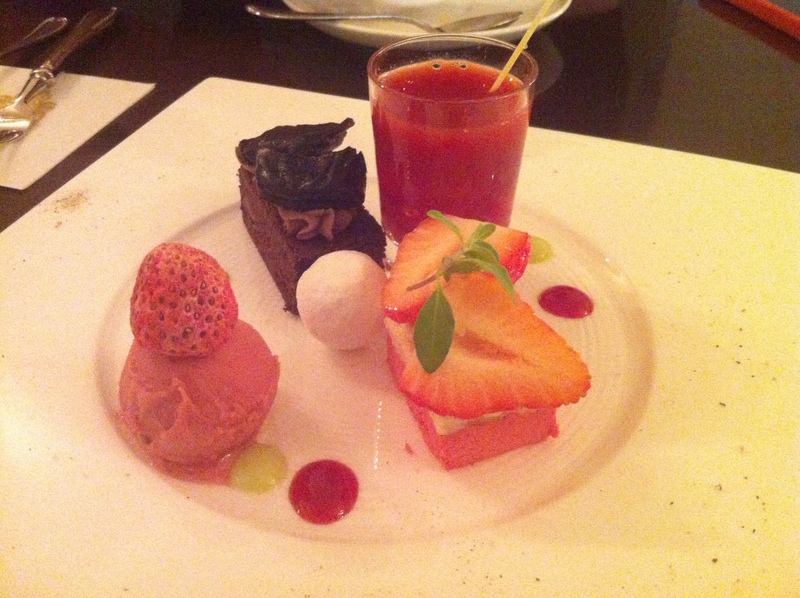 I tried the seasonal dessert sampler, and had a hot chocolate. Terrible photos! Apparently my old iPhone didn’t like the lighting in there. 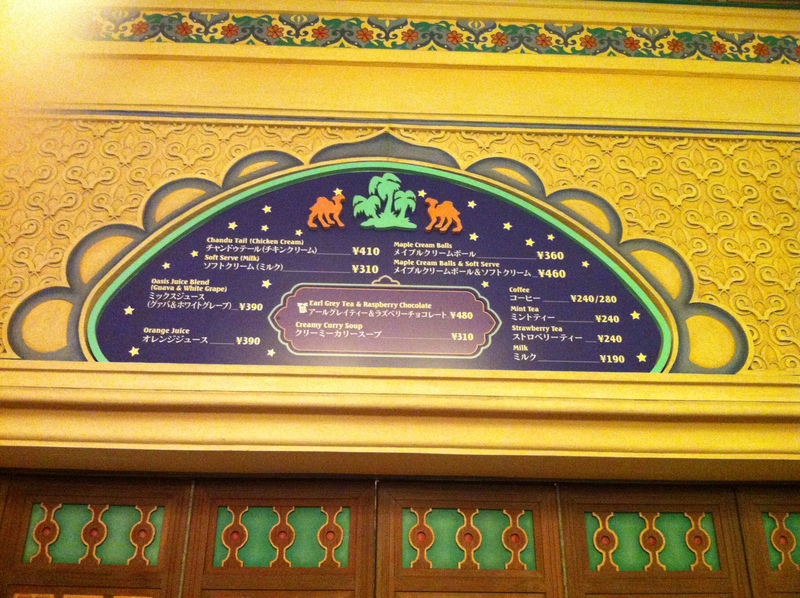 I’d say the real thing looked somewhere in between my photo and TDR’s photo. From memory it was some strawberry gelato with a dried strawberry on top (like the sort of thing that you get in cereal), a sugar coated almond, a bite-size piece of strawberry mousse cake, chocolate brownie with a prune on top, and “strawberry soup” – we weren’t sure whether we were meant to drink it or pour it over and or all of the other bite-size treats. When we got to Magellan’s, there was a lot of confusion. The people who enquired about the bar before us were told to come back later. Then they told us to wait at the door – they didn’t tell us how long we’d be waiting, but I could see that almost all of the tables were empty. Then they told the next people to line up that it’d be a 40 minute wait. We went in 5 minutes later, and most of the empty tables remained empty the whole time we were there. I have no idea what that was all about! 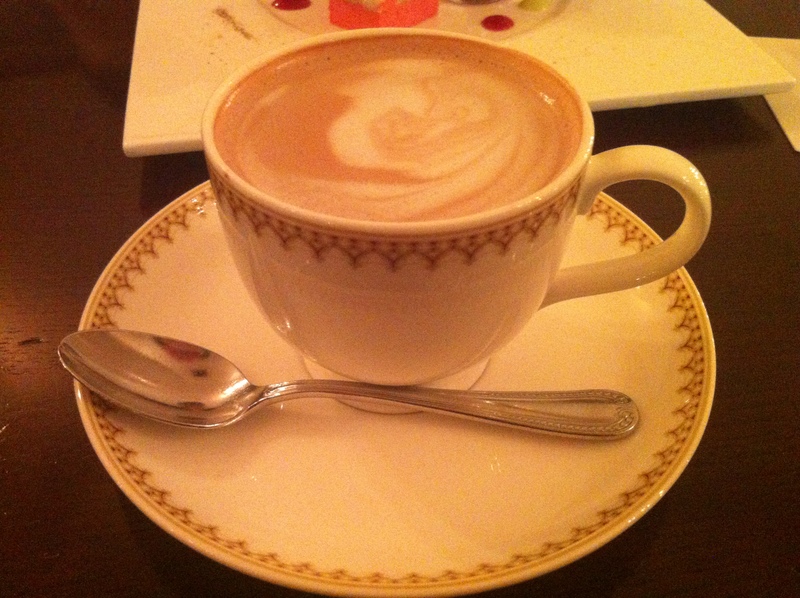 The food was okay, but not really worth the price (￥1,850). 5. 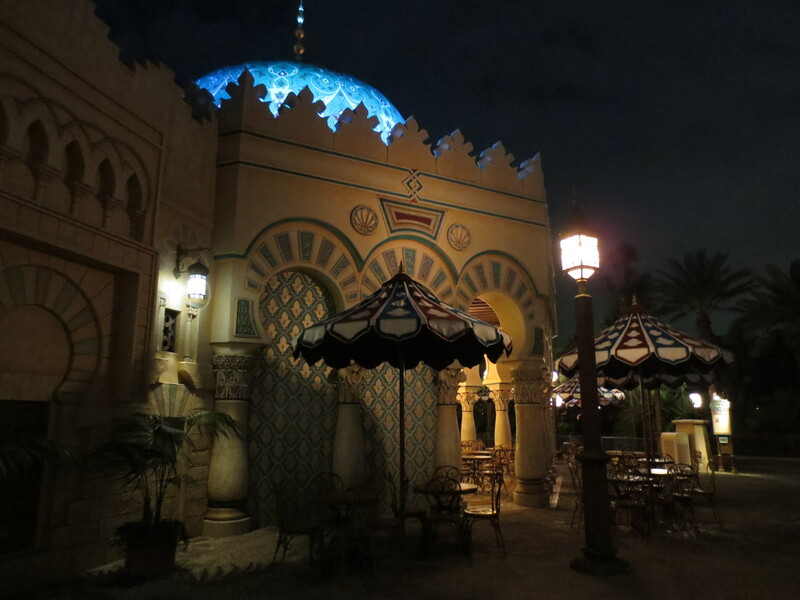 Finally, I wanted to check out the latest treat at Sultan’s Oasis, but by the time I got there, it had closed. Earl Grey tea & raspberry chocolate! I have no idea whether this is a drink, an ice-cream or some other kind of dessert, but I’m rather disappointed that I didn’t get to find out. 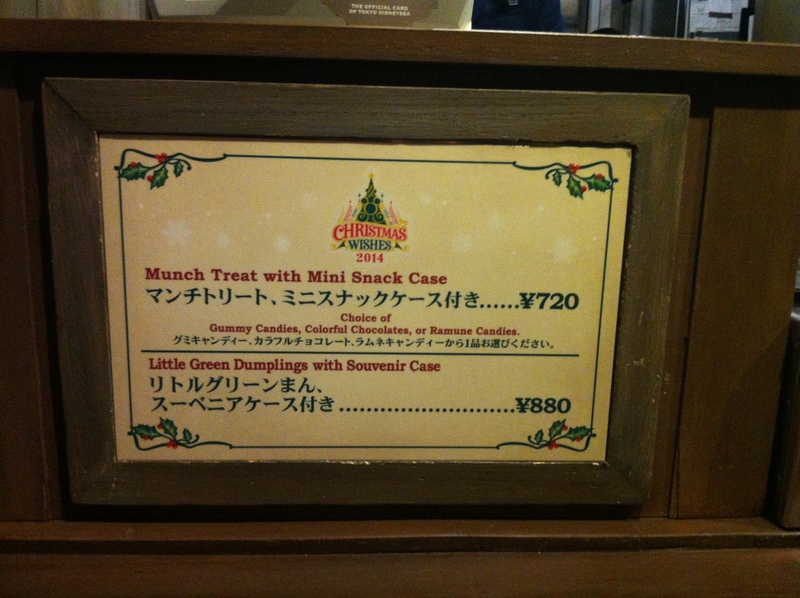 That just about sums up the Christmas related food at TDL. 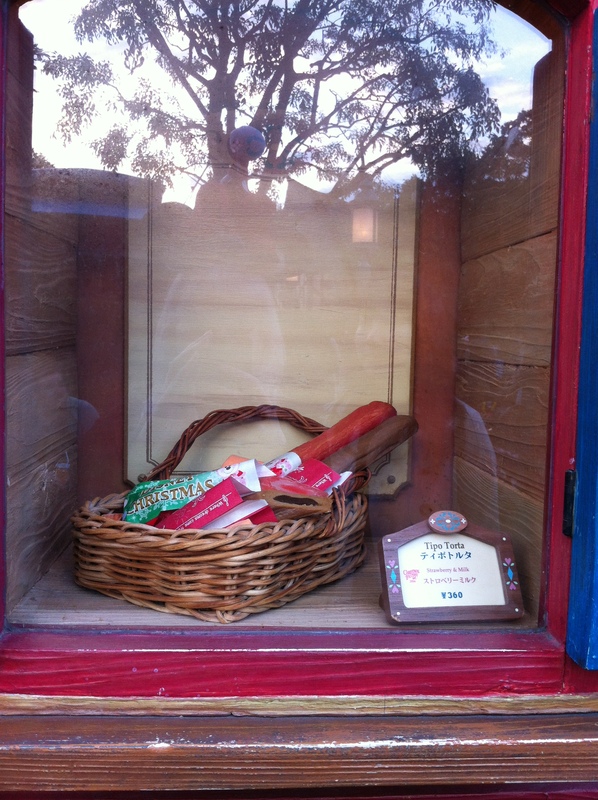 Next up, Christmas in the parks – decorations, headgear, merchandise and of course the parades!